Combines advanced technologies with innovative features to deliver state-of-the-art thermoregulation while promoting family-centered care. Stop worrying about a clumsy overhead heater. Our design allows you to stay cool and comfortable (without having to duck under a heating element). The Panda Warmer's compact size allows more room for you and your patient's family to interact with baby. Features such as the hands-free alarm silence, a full-color display, and integrated scale make your job easier and help you provide better care to your patients. An innovative recessed heater design lets you see and access your patients, and it keeps patients warm and content while keeping you cool and comfortable. Our integrated in-bed scale makes weighing every baby quick and easy. You can turn on the Panda warmer well in advance so you know the bed will be warm when the baby arrives. 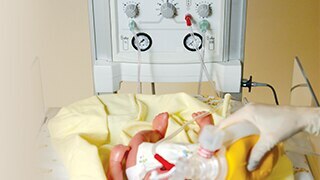 Optional integrated SPO2 and resuscitation systems allow you to access everything you need to deliver resuscitation therapy to high-risk newborn in case things don’t go as planned. The Panda warmer is fully supported with optional multi-year service coverage, technical support, and additional education and training programs. GE Healthcare has received the MDEA award for the outstanding, innovative features of the Panda warmer. Integrated resuscitation is always available with minimal setup for high-risk deliveries, which helps standardize resuscitation protocols across the perinatal care area. Dimmable observation light allows you to easily control light levels. 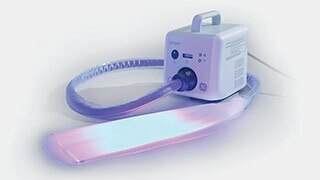 Easy-to-position integrated amiable light provides better lighting during procedures. Caregivers can easily silence alarms by simply waving a hand past the sensor, preventing cross contamination and addressing alarm fatigue. Full-color control panel is readily accessible and easy to use. All patient information is vividly displayed on the monitor in real time, even providing a photo opportunity for new parents. Integrated options include T-piece or bag and mask resuscitation, blended oxygen, SpO2 monitoring and in-bed scale. Ensures that what you need is always available with minimal set-up. Full resuscitation capability and SpO2 monitoring, meeting clinical standards in a single configuration.